Congress workers performed ‘Shavaasana’ in Indore on third International Yoga Day to mark their protest against the deaths of five farmers in police firing in Mandsaur. 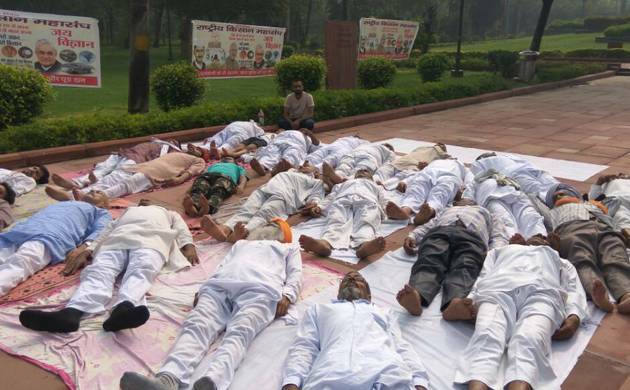 Farmers too performed ‘Shavaasana’ at Kisan Ghat in New Delhi to protest against the policies of the government. The Congress workers in Madhya Pradesh gathered at an installation in Bhopal and decided to protest in a unique way on International Yoga Day. Five persons lost their lives and several others were left injured in Madhya Pradesh’s Mandsaur as farmers’ protest turned violent due to alleged firing by the police. The farmers have accused the Shivraj Singh Chouhan government of not providing them enough support in the wake of drought situation in the state. Meanwhile, Bharatiya Kisan Union workers also staged protest against killing of farmers in Mandsaur at NH-28 in Barabanki, Uttar Pradeshby performing 'shavaasana'.